Once, years ago, I went fishing with my father and sisters. There were worms and the hook and line got tangled in the tree behind me. That was the first and last time I went fishing. Today the Amish kids from up the road came by to fish our pond. 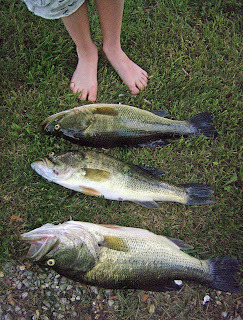 Here are the three largest fish of the eight fish they caught. With lures. No bait. I wish you could have seen those kids’ delighted faces. But they don’t believe in having their photos taken and were very plainspoken about it. Just yesterday they helped bring in 600 bushels of peaches from the orchards belonging to their families. I am speechless in the face of such achievements.